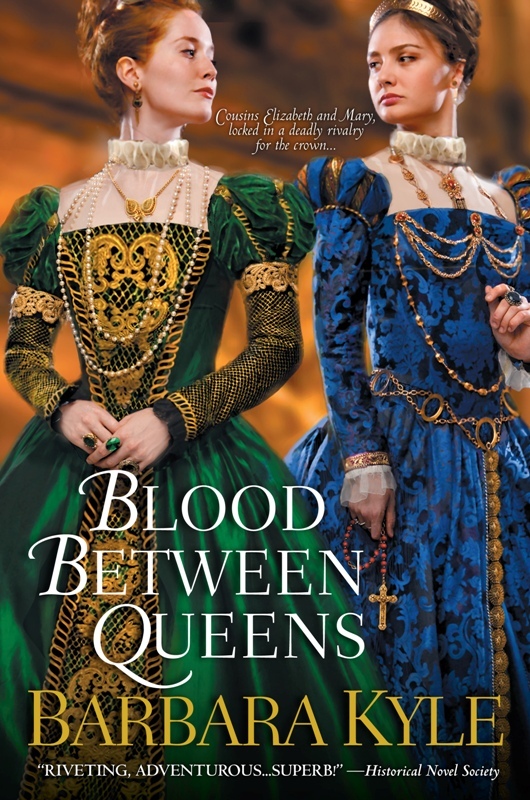 Barbara Kyle's Thornleigh series about a ficticious family in 16th century England has a new addiction with "Blood Between Queens." I initially giggled at the overly dramatic cover (and perhaps the slight historical manipulation as well, if the two are supposed to be Elizabeth I and Mary Queen of Scots) but after diving into the book, that was all the giggling to be done. This book is so dark! I've never read any others in the series so I can't be sure if all are like this, but Blood Between Queens was abound with attempted rapes, murders, explosions, and sleazy people. The focus is on Justine Thornleigh, a teenager who through her family ties (I think there is an extensive backstory in previous books in the series) is able to serve Queen Elizabeth I as a spy. Mary Queen of Scots has fled Scotland and is looking for refuge in England. Elizabeth sends Justine as a lady in waiting for Mary with the hopes that Justine will lure a confession of treason out of the Scottish queen. Justine ends up finding herself sympathizing with Mary, as they share much in common. Justine feels the tugging of betrayal between Mary and Elizabeth and it's hard to tell which way she will turn. As I said before, a good number of the characters were total sleazeballs. There's an edge of creepiness in everyone that feels quite uncomfortable. As weird as that is, I feel like it's accurate - how else could anybody make their way up in harsh world they lived in without being a little cunning and advantagous? Blood Between Queens can be read as a standalone novel, but you really have to read the rest of the series to understand the backstory. I was lost with the entire subplot of Justine's uncle/aunt and father. One other issue I had was with Justine and her fiance....I didn't feel the connection at all. I didn't recognize any spark and he just seemed like a pretty boy. It made me sad because I wanted someone better for Justine! She's a fabulous and complex character. I enjoyed the story overall but just wish I had understood the family history better to get a more complete understanding of the story. Nevertheless, this is still a great read for historical fiction lovers! I'm beginning to feel like Santa Claus here with all of the free books I'm able to giveaway to you! Enter for a chance to win Blood Between Queens by leaving a comment below with a way to contact you. You have until May 6th, USA entries only please. Good luck! This book sounds like one I would like. I have added it to my tbr list. I would love to read this book. Thank you for the giveaway! I love this series and ou can't wait to read the newest book in it! Thank you for the giveaway. I think those were pretty dark times but I guess any time can seem dark. History can be pretty facinating. please enter me for this giveaway!!!! Blood Between Queens sounds like a must-read for me!! !